Orchids As House Plants? You Can Easily Grow Them! Grow Orchids As House Plants? Yes, You Easily Can! Orchids as house plants act like any other house plant, they need water, light, fertilizer and humidity. And of course, like every living thing they need love. If you can you should talk to them. They love being acknowledged like that! Get our bi-monthly newsletter Orchidaceae for Orchid Care Information and Growing Tips, a free subscription to great orchid information. If you have not already checked it out go to the page called "Frequently Asked Questions" or FAQ's. There is lots of good free information on orchid growing. One of the long standing myths that I still hear is that orchid house plants are difficult and finicky to grow. Well, plain and simple, the answer is NO. In fact, orchids as house plants are easy to grow and will continue to bloom for years. Some orchid plants have been around for centuries. Orchid as house plants and orchid plants in general will need watering periodically, usually you can water once a week. Remember, most orchids are air plants and this means you will see their roots. Their root system is very efficient in storing water. Here is a watering guide you can use: Cattleya, Oncidium and Dendrobium orchids like to dry out between watering. An easy way to water is to put the plant in the sink and let water flow through the plant for about 1 minute. Remember, let the water drain from the plant before putting it back into the decorative pot. Phalaenopsis orchids like to almost dry out between watering. To decide on the next watering is to stick your finger or a wooden pencil about an inch into the media which should feel spongy and not bone dry. Paphiopedilum and Epidendrum should be slightly moist so that watering can be twice a week. If the humidity in your home is low (below 40%) you may need to either mist the plant occasionally or use a humidity tray. The tray is simply a metal or plastic tray that is filled with pebbles and 1/2 of water. The plant would sit would sit on the pebbles. Be sure not to let the plant or roots sit in the water while on the tray. Check out the Humidity Trays that I sell on the link below. I love these trays. 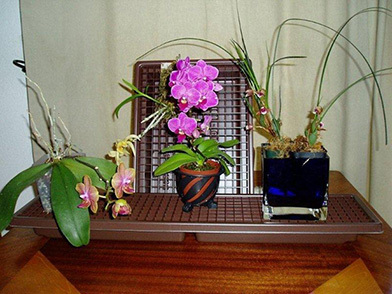 I grow most of my orchids as house plants and I have used these trays for over 7 years in my house. I love these trays. They work really well. Light is the next most important element to growing orchid as house plants. As a general statement most orchid house plants do well in medium light. This would in a window or an area that could get about 4 hours a day. Cattleya orchids do well in this light but can also do well in a sunlit area for up to six hours. Phalaenopsis do well in indirect but bright light. Most orchids do well in normal house temperature. The low temperature at night do not impede the growth. Here is a little guide you can use.